The 'May 2017 Certified Public Accountant (CPA) board exam results', conducted by PRC’s Board of Accountancy are released five (5) working days after the last day of board examination. Aside from the official list of passers, top 10 examinees, top performing schools and performance of schools are also posted. Vianca Pearl Inot Amores and Marianato Jesus Berdin Del Rio, both from University of San Carlos ranked first in the exams having 92.67% rating. 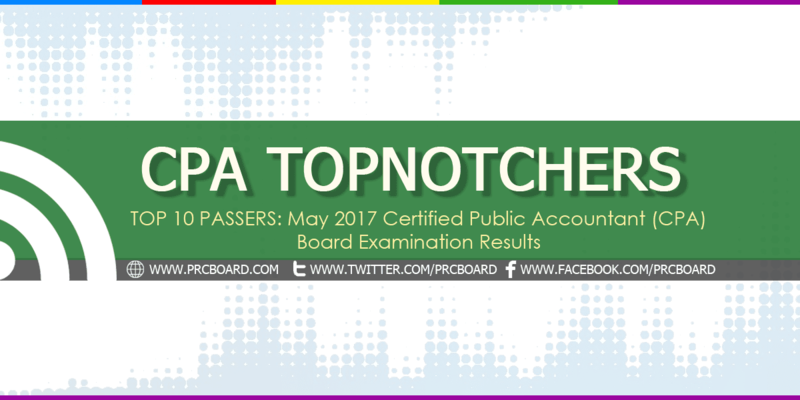 Below is the complete list of CPA top examinees, courtesy of PRC. While most examinees are asking about the possible release date, as mentioned in the main page of this article, it will be out by May 29, 2017 (Monday). halos tapos na ang May 29 ah, wala pa ring result!!! Whats taking you so long!!!! Baka ina-adjust pa para marami/konti ang papasa depende sa need ng PRC, to control the number of CPA in practice. ganern. Congratulations to Gea Cris Odag - We are so proud of you. Wow grabe huh! University of San Carlos of Cebu na naman,,.From Law topnotcher and now CPA ! FYI lang, matagal nang nag to'top ang San Carlos sa mga CPA exams. Congratulations Demi Anne Cuevas, CPA! wow ang galing naman ng mga taga-USC!!! congrats! Where Pamantasan ng Lungsod ng Maynila (PLM) placed themselves?